Continuing a tradition started at our 25th reunion, a post-concert “Class Hootenanny” is scheduled for Monday night in the Queen’s Head Pub in Mem Hall basement. 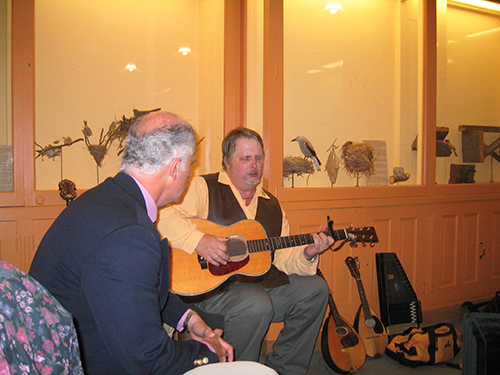 Classmates and guests, still buzzing with folkie enthusiasm after Tom Rush’s performance, are invited to share their music––from Baez and Dylan to Old Crow Medicine Show––in an open sing-around, facilitated by Allen Hopkins, who’s been coordinating these reunion sings since 1990. Some spare guitars will be available, listeners as well as singers are welcome, and requests will be honored––to the extent our increasingly unreliable memories can come up with them. We hope the pub ambience will evoke those well-remembered evenings at Club 47.